In a high-ceilinged historic building on Piccadilly right by the Ritz hotel is one of London’s most-talked about restaurant – The Wolseley. Originally designed as a car showroom in 1921 with grand pillars and marble floors, it was acquired by Barclays Bank in 1927 and was a bank until 1999. It was transformed into a restaurant by exceptional restaurateurs, Chris Corbin and Jeremy King, and opened in 2003. The last time I was here in the beginning of the year, I didn’t get a chance to go so my husband and I made it a point to book dinner for our first evening in town. We had stayed in an airport hotel on Wednesday evening and went to London early on Thursday morning. After checking into the London Marriott Grosvenor Square, we were desperate to have a good breakfast and walked briskly down New Bond Street towards Piccadilly somehow managing to ignore the eye candy displayed on the windows of all the chic boutiques. 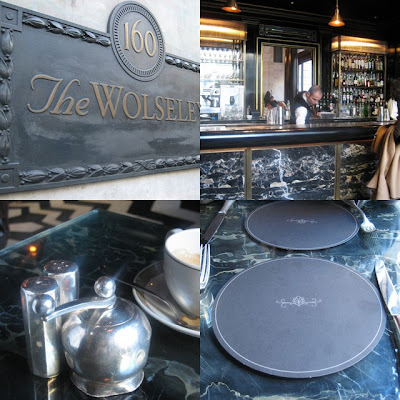 When we reached Piccadilly, we were debating whether to eat at one of our London favorites, Patisserie Valerie when we decided to go straight to The Wolseley instead and try and get a table for breakfast. We entered a packed restaurant about to change over from breakfast to lunch. After a short hiccup at the door with the hostess who didn’t know if they served any food between the breakfast menu that ended at 11:00 and the lunch menu that started at 11:30, we were finally seated at a cozy banquette in the bar area and given the All-day menu which luckily had a few breakfast dishes on it. We settled for double espresso macchiatos, a small Eggs Benedict for me with a mesclun side salad and the Omelette aux fines herbes plus the crayfish, avocado and bacon salad for my husband. The coffees arrived immediately along with the table setting using hotel silver quality cutlery flatware and antique-looking pewter salt and pepper shakers. On the glass-topped black marble tables, I have to say that they looked chic. 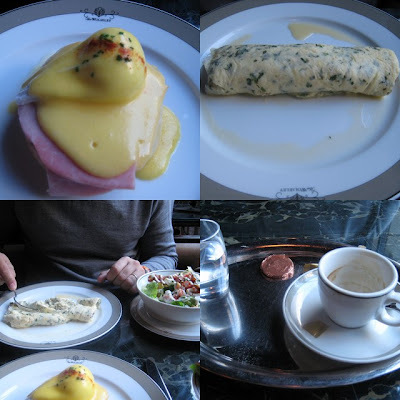 Our food was served soon after – the omelet baveuse(runny) as was ordered and my eggs Benedict perfectly executed. The crayfish salad was very good although strangely, my mesclun salad arrived without any dressing on it. While we enjoyed our meal, the place started to fill up again for lunch and the breakfast tables were reset with crisp linen, silver flatware and simple glasses. The lunch and dinner menu at The Wolseley is brasserie-based and is simple enough so that you will always find something you want to eat. There’s nothing like a large buzzing restaurant to make any kind of meal exciting. Although we enjoyed our breakfast a lot, we decided to cancel our dinner booking which wasn’t until 10 p.m. (too late but that was the earliest table they could offer) and come back the next time we’re in London for a proper meal. Open from 7 a.m. to midnight Mondays to Fridays, 8 a.m. to midnight on Saturdays and 8 a.m. to 11 p.m. on Sundays. *** Food – Classic Brasserie fare, simply prepared but a bit overpriced. *** Service – Can be hit-and-miss, they’re so packed that you can feel a bit ignored.